World Music Pedagogy, Volume IV: Instrumental Music Education provides the perspectives and resources to help music educators craft world-inclusive instrumental music programs in their teaching practices. Given that school instrumental music programs—concert bands, symphony orchestras, and related ensembles—have borne musical traditions that broadly reflect Western art music and military bands, instructors are often educated within the European conservatory framework. Yet a culturally diverse and inclusive music pedagogy can enrich, expand, and transform these instrumental music programs to great effect. Drawing from years of experience as practicing music educators and band and orchestra leaders, the authors present a vision characterized by both real-world applicability and a great depth of perspective. Lesson plans, rehearsal strategies, and vignettes from practicing teachers constitute valuable resources. 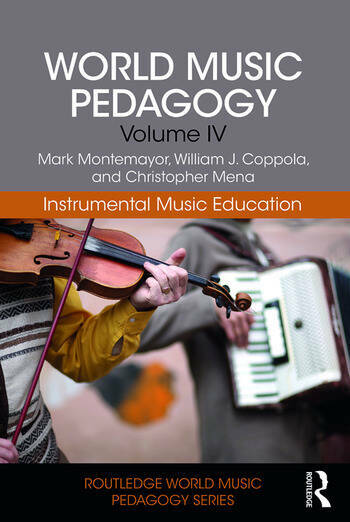 With carefully tuned ears to intellectual currents throughout the broader music education community, World Music Pedagogy, Volume IV provides readers with practical approaches and strategies for creating world-inclusive instrumental music programs. Mark Montemayor is Professor of Music and Head of Music Education at the University of Northern Colorado. William J. Coppola is Assistant Professor of Music Education at the University of North Texas and a Smithsonian Folkways World Music Pedagogy certified music educator. Christopher Mena is a Smithsonian Folkways World Music Pedagogy certified music educator.